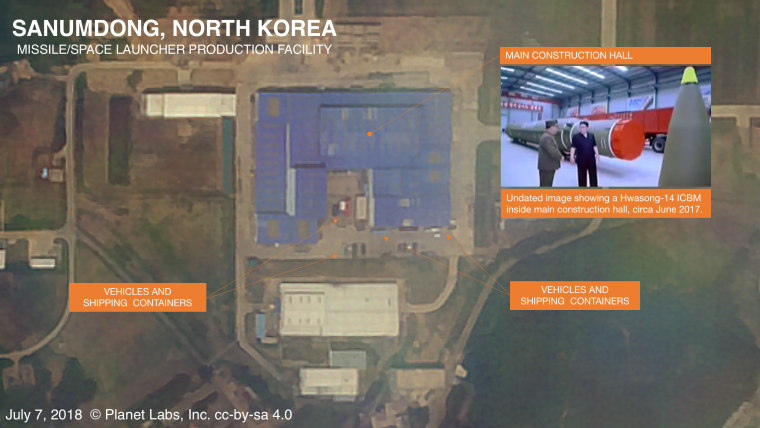 Satellite photos and U.S. intelligence show North Korea continues to work on its missile program, even after Trump and Kim Jong Un's meeting in Singapore. WASHINGTON — Arms control experts confirm to NBC News that both satellite photos and U.S. intelligence show North Korea is continuing to produce ballistic missiles and work on its missile program, even after the historic June summit between President Donald Trump and North Korean leader Kim Jong Un. The experts point specifically to a July 7 satellite photo that shows activity consistent with missile production. News of the continued missile production was first reported by the Washington Post. It comes one month after NBC News was first to report that North Korea had increased production of fuel for nuclear weapons at multiple secret sites, and that the North Korean regime was working to conceal those facilities from the U.S.
After the June 12, 2018 summit in Singapore, Trump and Kim issued a communique to establish U.S. and North Korean relations, but they did not address missile production in the written statement. North Korea has already produced an intercontinental ballistic missile capable of reaching the East Coast of the U.S., and has boasted that its missiles can carry nuclear warheads. U.S. intelligence has assessed that North Korea can fit a miniature nuclear warhead on a ballistic missile. In a press conference after the summit, Trump cited the fact that North Korea had not tested a missile since November 2017 as a concession from the regime. The post-summit communique stated that "the DPRK [North Korea] commits to work towards complete denuclearization of the Korean Peninsula."